First COMRADES press release is out! 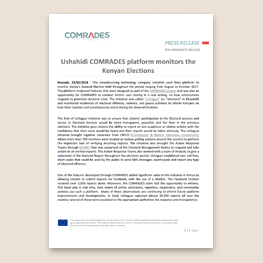 Focused on the Kenyan elections, this first press release informs the audience about the Ushahidi COMRADES platform used to monitor Kenya's General Elections in 2017. The initiative was called "Uchaguzi" and monitored incidences of electoral offences, violence and peace activities to inform Kenyans on how their counties and constituencies voted during the General Elections. 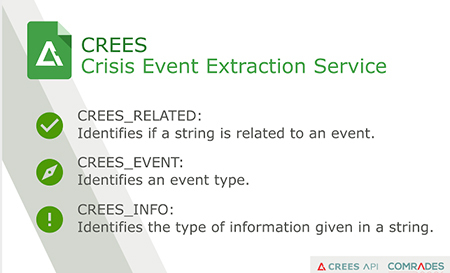 The CREES API is made available as Google Sheets Add-on in order to integrate with typical analysis workflows. The add-on adds three new spreadsheet functions that can be applied to cells and columns. Uchaguzi Partnership, through Ushahidi, is part of the network of the COMRADES project. 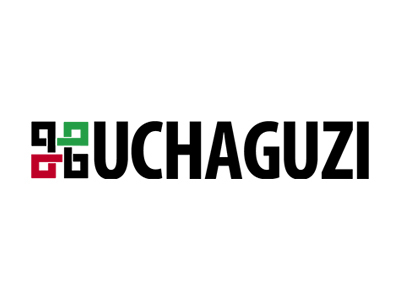 Uchaguzi will provide us their lessons learnt from the active citizen participation in Kenya’s elections.